Egyptians have begun voting on a new constitution endorsed by the Islamist president Mohamed Morsi, which has divided the country and sparked deadly unrest. President Mohammed Morsi and his Muslim Brotherhood have campaigned heavily in favor of the draft document, which may define Egypt for years to come. Opponents say it is poorly drafted and overly favors Islamists. The opposition National Salvation Front coalition has accused the Muslim Brotherhood of trying to rig the vote. However, the ballot, which is staggered over Saturday and a second day of voting in a week’s time, appears to be going smoothly with indications of a high turnout. Many people said they were voting for the restoration of stability in Egypt. 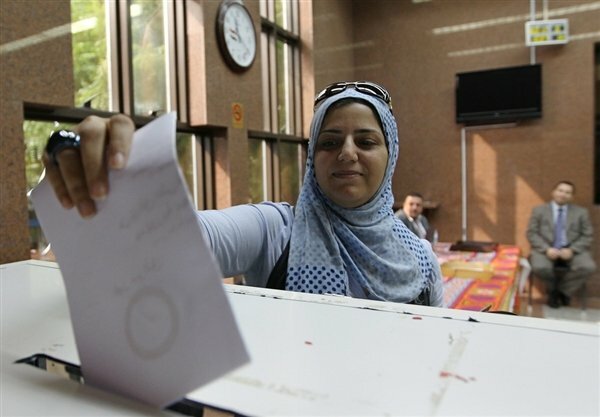 Saturday’s voting takes place in Cairo, Alexandria and eight other provinces, a week before the rest of the country. Some 250,000 security personnel have been deployed to safeguard a referendum in which more than 51 million people are registered to vote. Polling reportedly had to be spread out because few judges were willing to supervise the referendum but human rights groups have expressed fears the results from the first round could sway the opinion of those voting in the second. A constitution must be in place before elections can be held early next year. Mohamed Morsi was elected president in June with just over half of the vote, more than a year after Hosni Mubarak was overthrown in a popular revolt in Egypt, the most populous country in the Arab world. The referendum is more than a vote on obscure clauses – it is about whether Egypt should be an Islamic country or a secular one. The simple ballot paper just asks if Egyptians support or oppose the new constitution. Supporters include President Mohamed Morsi, who voted near the presidential palace in the Cairo district of Heliopolis, the Muslim Brotherhood and most other Islamists. Opponents include liberals and others who want a more secular future for Egypt. Some of them say the new constitution would take away some of the new freedoms hard won in last year’s revolution. Voters interviewed by Reuters news agency in Cairo were hopeful the vote would bring some calm to Egypt. “I see this as a positive step for the country… a good base that we can start to work from,” said one, Ahmed Gindy. In the northern port city of Alexandria, where there were clashes on Friday between rival activists fighting with clubs, stones and other weapons, Mohamed Ewais explained why he was voting “No”. “I cannot accept a constitution with very limited, very limited actually, rights for minorities, rights for women, rights for even children,” he told the Associated Press news agency. The violence in Alexandria reportedly broke out after a cleric at a mosque urged worshippers to vote “Yes”. Clashes continued late into the evening, with police firing tear gas, and at least 15 people injured in the fighting. President Mohamed Morsi has granted the army powers to arrest civilians. Supporters of the draft constitution have accused the opposition of sowing “lies and discord” about the referendum. The opposition National Salvation Front had vehemently opposed the referendum but this week said its supporters should go to the ballot boxes to vote “No”. In a statement on Saturday, it expressed “deep concern… over the number of irregularities and violations in the holding of the referendum”. This, it alleged, pointed to a “clear desire for vote-rigging by the Muslim Brotherhood”. However, the Egyptian army’s chief of staff, Gen Sedky Sobhi, said he was satisfied with the situation inside and outside polling stations.